This is NOT a traditional jambalaya recipe, but I had some ingredients to use and it was just so darn easy! 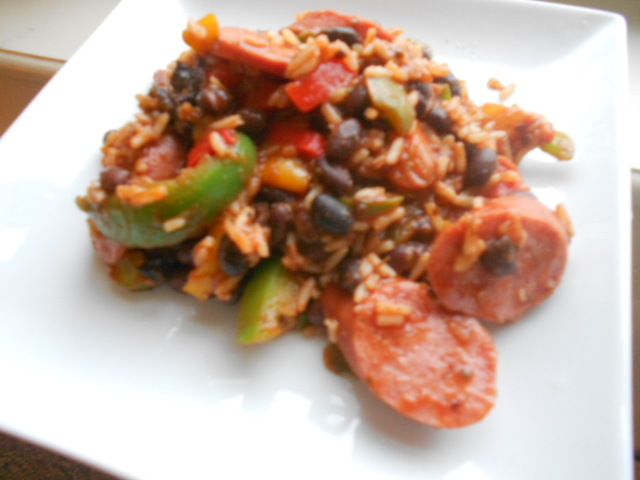 Again, I want to give you a heads up that this is not a traditional jambalaya recipe, but it brought back some fun memories from our time in New Orleans. Spicy dish. Preheat a pot to medium. Add the oil, salt, spices, peppers, onion, and stir. Preheat a grill pan and toss those kielbasa bites on top. Brown just enough to allow for some grill-marks. Add the beans and tomato sauce to the pepper mixture. Once the rice is ready, mix in with the veggie/bean mixture. If you have a hungry husband like I do, this recipe is enough for two people.